Tales of Lazlo Ferran, Freelance Editor. What are yours? I haven’t edited a book for another writer since Amit Bobrov’s The Journals of Raymond Brooks. Editing is a marketplace starved of money but I am determined to find more work to fund my writing. Consequently, a few days ago I joined an editing group on LinkedIn and posted a link to my editing page and asked for feedback. It was a baptism of fire! I must say that editors are a tough bunch! They didn’t hold back and told me the page was too chatty and unprofessional. If you are looking for an editor, I think you will approve of the new page. I have reduced my rates somewhat because of the tough market conditions at the moment. However, even these prices are only a guide; I am open to negotiation. So if you are looking for an editor for your new book, please contact me. I am in the final edit for two books now; Escher’s Staircase (provisional title) and World Like Dust. Some of you may be interested to discover that I have completed a first draft of Ordo Lupus III (the title will remain a secret for now) but I have no planned publishing window for that as yet. I assure you, I am not! I am working hard to bring you these new books and to make sure they are as good as I can make them. I have completely re-edited The Man Who Recreated Himself because it was looking very tired. There is even a new scene in it but most of the changes are just grammar and copy editing. I have re-edited Ordo Lupus II, making only minor grammar changes. I have completely re-edited Iron II: Unknown Place, Unknown Universe so this is actually a third edition and very different to the second. There are different chapter titles, 15000 less words and many of the alien scenes have been transposed to different parts of the book to skew the perspective slightly more towards their view of the Universe. If you were to read the new version, I think you would approve. I will also be redesigning the cover in the next few weeks and I hope you like the change. On the subject of covers, I will probably change the covers for the following books; The Man Who Recreated Himself, Infinite Blue Heaven and the Short Stories Series to make the look of all my books more homogeneous. 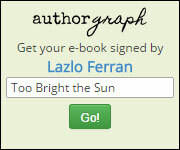 I also had my first request for an autograph, using authorgraph, which was exciting. 3. Occasionally the eccentricities of software baffle even me. Today, I submitted a pdf for Iron II to the distributor website, believing it to be correct. I just happened to glance through the pdf at the last moment to check that the most critical thing, the chapter headings, were in the right place and guess what? One of them wasn’t. Since I have switched from Mac to Windows, I have never had a case where a pdf doesn’t exactly reflect the word document. But this time, it didn’t. I checked again and the culprit was a set of asterisks which, for some inexplicable reason, were jumping down to the next page in the pdf. I tried several times to fix if, first by reducing the space after, then by shortening some previous sentences to shorten the previous page. It took me an hour to get it right! Just lucky I spotted it, I guess, but what a pain! That is all my editing tales for now. All in all, I am very busy and I sometimes wonder where I will find time to write my next book! If you are looking for an editor for your novel, please visit my Writing and Editing Services page. If you are an editor and have some good stories, please do drop a comment in below.